This fabulous snack suggestion comes from my cousin who runs an adorable Bed and Breakfast in Jericho, Vermont. Incidentally, her brother was our tour guide during our recent trip to St. John. I guess that side of the family digs the hospitality business. Anyway, her suggestion is something that I’ve actually done before – not only to save money but also to have a diet-friendly snack food on hand at home. 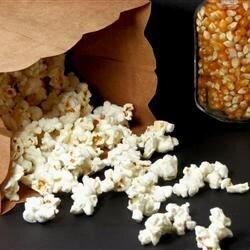 I crave salty snacks so homemade microwave popcorn really hits the spot and isn’t as bad for you as potato chips. All you have to do is buy a set of brown lunch bags and a pack of popcorn kernels (I get bags of it in the bulk aisle at the Safeway). I put about 2 tablespoons of kernels in the bag, folder over the top a few times, and toss it in the microwave for about a minute and a half. The same microwave popcorn cooking rules apply here – if the popping noise starts to space out then it’s probably done. Keep a misto sprayer on hand for when it’s done. I usually do a couple of sprays and add some seasoning. My favorite is Tony Chachere’s Cajun seasoning, but you can do all kinds of things. Thanks to my darling cousin for doing the math. Here is the budget breakdown. For a grand total of 50 servings at $0.06 a serving. In her own words: Ba da bing, good, low-fat popcorn. Thanks for the suggestion! Have any other Discountess (and diet) friendly snack ideas? Send them my way! Blushing profusely up here at Sinn’Inn. Thanks for the mention!